These three components are part of B-format Ambisonics (omitting the vertical component Z) and can be derived from the output of a Soundfield microphone, or a Core Sound TetraMic or other similar arrays. The X and Y components are identical to the M/S (sum and difference) components of classical Blumlein stereo, the theory and practice of which are well known. In my opinion, the greatest advantage of using a Blumlein stereo pair of microphones over other stereo techniques is the ability it gives to locate with pin-point accuracy the placement of the original sound sources when played back over a pair of high quality loudspeakers. This sonic realism helps to compensate for the lack of visual cues and increases the listenener’s involvement in the music. A minor disadvantage of the Blumlein coincident figure of eight stereo pair of microphones (which has actually been exploited in some stereo recordings) is that sounds from the rear are folded into the stereo image; but crossed over, with rear left signals appearing in the right hand stereo speaker and rear right sounds coming from the left hand speaker. When audience noises and general reverberation are the only sounds coming from the rear, this crossover is generally not an issue, as audience noises emanating from the left sound just as effective when played back from the right, and vice-versa. However, the addition of the W omnidirectional ambisonic component makes it possible to discriminate between front and rear signals and to feed them to the front or rear loudspeakers respectively. Thus the hacking cough of an audience member on the rear left comes from the rear left, as expected, and the ability accurately to reproduce the position both of any players who are behind the microphone and the applause and reverberation from the rear and sides of the hall gives greater clarity to the sound and is an important step towards the more realistic reproduction of music. Those who have researched Ambisonics point out correctly that higher order systems with more microphones and more loudspeakers give even greater accuracy. This, of course, comes at much greater concommitant expense, and I am interested to see how far one can extend the realism of Blumlein stereo with the addition of only two loudspeakers at the rear — preferably of the same type as those at the front. The question then becomes that of developing techniques for recording and playing back pantophonically, using microphones chosen for the quality of their musical timbre, as has always been the practice when recording in stereo. I have always preferred the sound of microphones that employ large diaphragm capsules (LDCs) to those with smaller capsules, even though the smaller capsules often measure “flatter”, since I am convinced that, whether used in coincident pairs or in spaced arrays, they are responsible for the much-praised sound of the recordings made in the “Golden Age of Stereo” between about 1955 and 1980. Examples of stereo pair microphones with LDCs produced commercially in the 1960s are the Neumann SM2 and SM69, also the AKG C24 and, more recently, the Studio Projects LSD2. These microphones have in common the use of two double-sided 34 mm diameter capsules which are mounted above each other (and thus effectively coincident in the horizontal plane), one of which can rotate to any angle with respect to the other. There are two independent signal outputs for left and right, or M/S, and the pickup polar diagram of each output can be varied from omni, through cardioid, to figure of eight. In stereo I generally use such a microphone with two figure of eight polar diagrams at 90 degrees to each other (the X and Y components of pantophonics). In the 1970s, the Neumann company worked with Ben Bauer of CBS Records to produce a version of their SM69 stereo pair, the QM69, for recording in Quadraphonic Sound (QS), by providing four signals with a cardioid polar diagrams, one from each side of the two capsules, mutually at right angles in the horizontal plane. (See Bauer, Abbagnaro, Gravereaux & Marshall: The Ghent Microphone System for SQ™ Quadraphonic Recording and Broadcasting, JAES, vol. 26, pp. 2–11, Jan/Feb 1978.) But surround sound in the form of Quadraphonics never caught on — largely because consumer analog technology, in the form of the LP, was not up to the task of dealing with the demands of four channels — and the QM69 was soon discontinued by Neumann. 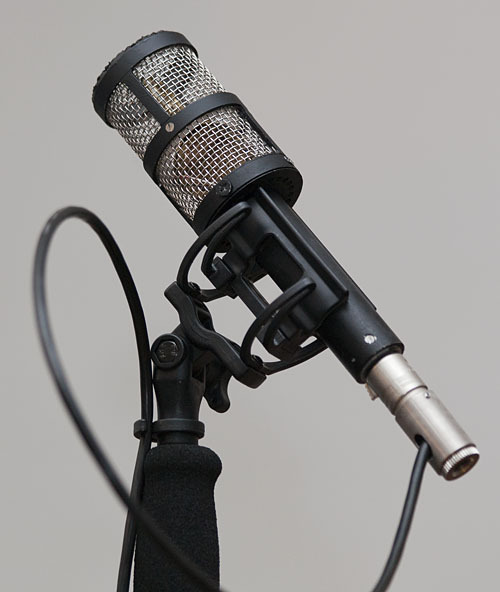 A similar microphone is made today by Pearl Microphones, and another recent special microphone is the Josephson C700S, which has three capsules mounted above each other. bottom: Schoeps MK8 bottom (X-channel). According to the Ambisonic Discography, Nimbus Records tried a succession of methods for capturing surround sound, beginning in the mid 1970s with a pair of Neumann SM69s or a single QM69, utilizing four horizontal cardioids. This approach was followed from the later 1970s by the use of the Mk.3 and Mk.4 Soundfield microphones and about 1980 Nimbus designed their own array, subsequently called Native B-format. 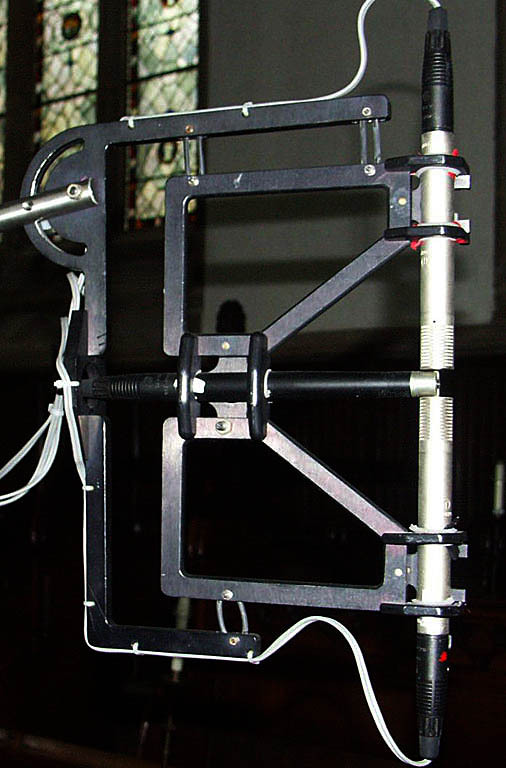 Dr. Jonathan Halliday, the company’s engineer/scientist, used a B & K (now DPA) omnidirectional microphone sandwiched between two Schoeps figure of eight microphones to give W, X and Y directly. Independently, Daniel Courville and Paul Hodges have developed variants on this theme, and there are others, the only problem with them all being that the close proximity of the three microphone bodies allowed by their small diaphragms inevitably degrades their polar diagrams by mutual obstruction of the signal. My recent experiments in pantophonic recording began in 2005 with an LDC stereo pair for the X and Y components and an omni microphone (W) placed just in front and on the dead side of the Y capsule. I used a small capsule microphone for this in order to minimize the degradation of the polar diagrams mentioned above. Independently of the Nimbus experiments described above I also in 2009 simulated a QM69-style array by using two stereo pairs, and was happy to note that Neumann’s four cardioid approach worked well: the four signals could be processed to give good pantophonic sound, and also combined to give excellent Blumlein figure of eight stereo. Listen to a stereo extract. But the array of two LSD2 stereo pairs above each other is, to say the least, rather cumbersome! Encouraged by these experiments, in 2012 I adapted a single LSD2 to make a microphone similar in principle to the QM69, but not identical in implementation. It uses modern hand-made reproductions of the capsules used in the original AKG C12 microphone and the C24 stereo pair. AKG abandoned this excellent design of capsule long ago in favour of a much simplified model made by machine; but, though the modern version of the capsule used today in AKG’s C414 microphone sounds very good, I prefer the sonic characteristics of the original design, which are those of the many of the recordings made in the “Golden Age of Stereo” referred to above. Unlike the QM69, the output of my microphone is not four cardioids, but W, X & Y — the three B-format signals required for pantophony. More recently (2015), with the generous collaboration of Granville Cooper, I have made a microphone in which two LDC capsules are mounted above each other at right angles and as close as can be physically achieved. The surrounding grille, necessary to avoid picking up mains hum, was made as open as possible. The direct output of the microphone is four cardioids, and these are combined in a control unit to give the W, X & Y signals. In tribute to its AKG heritage, I have called this a C48.